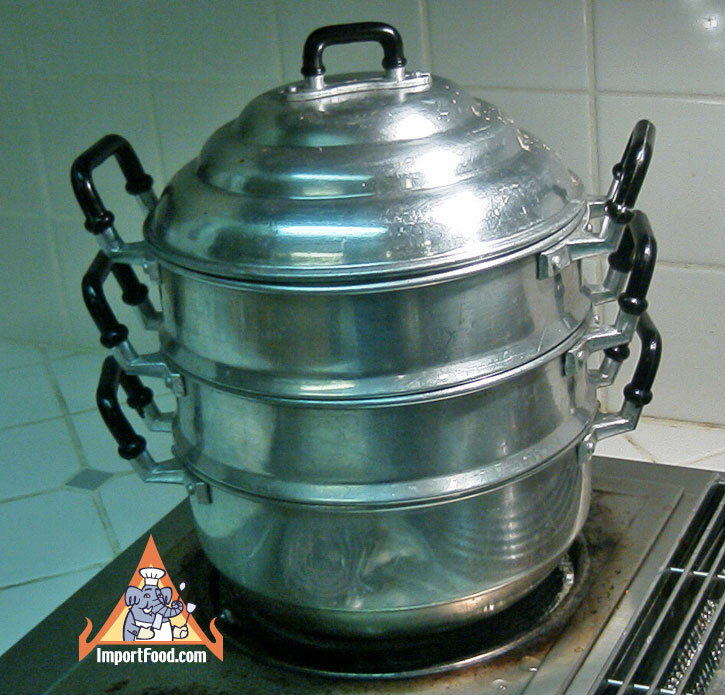 Here is an inexpensive and very effective, intelligently-designed stacked steamer. Made of durable aluminum, this steamer is approximately 11" wide (26 cm which is ideal width, anything bigger and it won't work well on American stovetops) and 13" tall, and is comprised of four separate pieces. 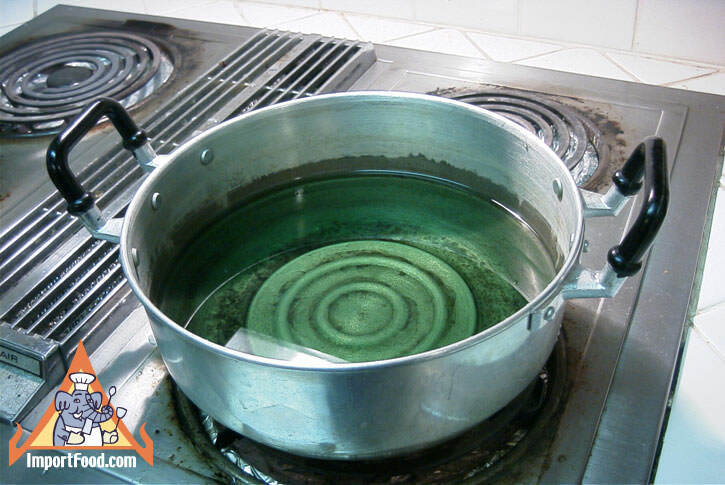 The bottom layer holds the water (up to 4 quarts), and fits nicely over any stovetop. The next two layers are similar to racks, as they have holes for letting steam pass through (see picture below). 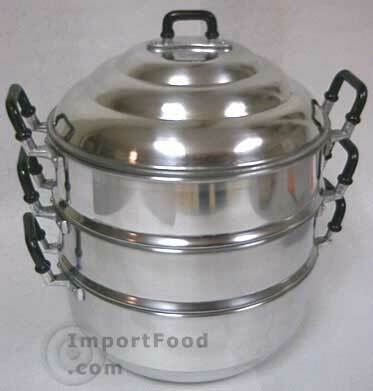 The top piece is a domed lid which is designed to prevent water from dripping on the food, and it accomodates larger food on the top layer. Much better than a bamboo steamer, as it's far easier to clean and can do more. 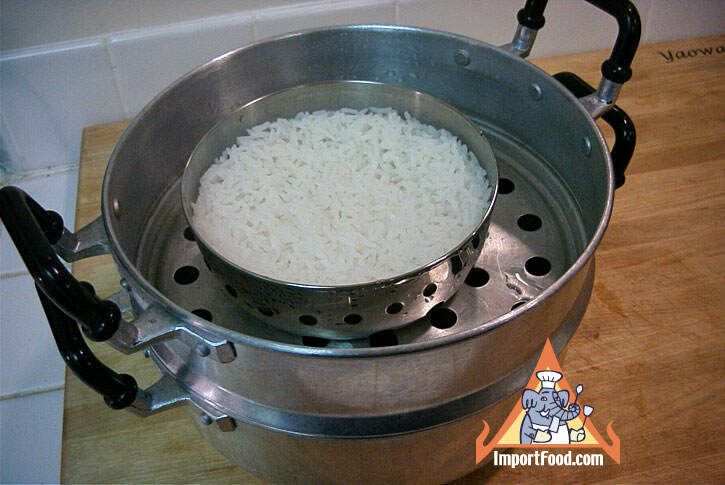 Our favorite steamer especially to make jasmine rice the old-fashioned way (see below for photos and street vendor video). Makes excellent fresh spring rolls and more. 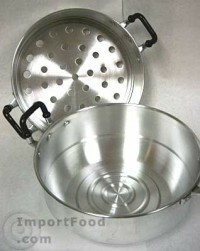 We also offer a larger stainless steel stacked steamer. In every Thai city and village, the people know and love khao tom mad. It's a vegetarian dish too, so according to our sources it may be impossible to find a Thai person that does not like eating it. Although it's a dessert recipe, this is very filling and could be served as a main course. The black beans are optional. We first discovered sugarcane prawns 15 years ago in Bangkok at a delightful Vietnamese restaurant called Sweet Basil, which is apparently still in business but at a new location. It's not spicy at all, and the sugarcane adds a nice touch of sweetness to the prawns. Aside from the wonderful taste of this recipe, just the unique appearance of prawn cakes on a sugarcane stick is enough to make your friends marvel at your cooking prowess. We know you'll like this special recipe if you give it a try. Khao neeo moon is a truly authentic Thai recipe. Mixing sweet dessert rice with a sugary seafood topping might seem like a bizarre combination that Food Network might sensationalize on one of their celebrity shows. Yet this is a favorite of Thailand found throughout the country, made interesting by a variety of toppings. Here we demonstrate how to make the rice, and two of the more common toppings. We prepared the rice in three colors. White, black (using black rice), and yellow (white rice colored with turmeric). In Thai tradition, the shrimp topping should go on the yellow rice. Khao Mahk is a common, everyday Thai dessert typically consumed by adults only, as it has a touch of natural fermented alcohol. We're not distillers, but this is likely similiar to the way Mekong Whiskey is made. This would be considered a Thai "comfort food", as it's often kept on hand for guests who might come to visit, and it's always served cold (store in the fridge until you are ready to consume). A refreshing, cool treat which is widely available from corner stores throughout Thailand. This is typically not made at home, perhaps due to the difficulty in finding the yeast balls necessary to make it. If left to ferment, the rice becomes alcohol, and home stills are not encouraged in Thailand so that may be one reason for the lack of yeast balls sold over the counter. 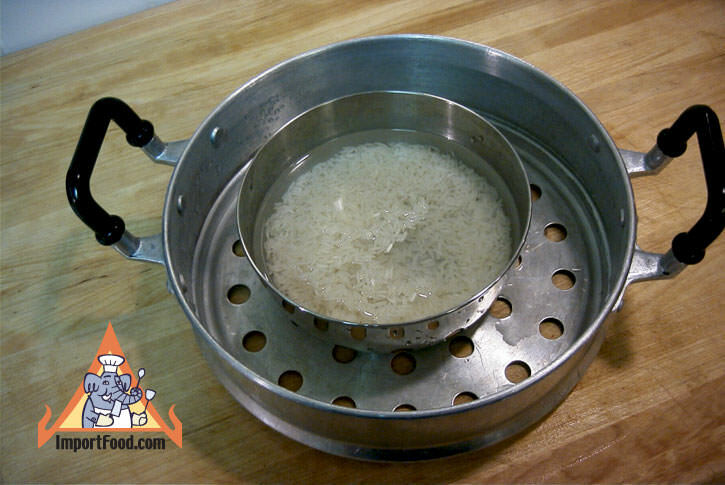 We were initially asked about khao mahk from a customer, and after some research we now can offer you all of the important ingredients to make your own. Just follow the detailed instructions below and follow the photographs we've taken of our cousin from Ladya, Kanchanaburi, who is well-known throughout the area as a khao mahk specialist. Many people may not realize that pumpkin, or any seasonal gourd, is an ingredient in many Thai recipes. This recipe works best with good old American halloween-style field pumpkin. Sankaya is a sweet custard, and here we made it with pumpkin but you can follow the same recipe and cook it in a coconut, or simply steam it alone in a dish and serve. Another option is to serve sakaya overThai sticky rice, a delightfully sweet and authentic Thai dessert. We love making this with Kabocha variety of squash which is readily available throughout the holiday winter months especially in the Pacific Northwest. It's also called Buttercup Squash, characterised by dark green skin and deep orange flesh. Hor mok is an elegant recipe full of rich flavors that represent all of what we love about Thai food. This heavenly combination of fish, red curry paste, kaffir lime leaves, sugar and coconut cream is one of our all time favorites. See the video below left, filmed in Thailand, for a purely authentic version. Also see our feature story showing a street vendor prepare hor mok with horseshoe crab. To make it in an American kitchen, some simple modifications yield the same fantastic result. We like to use green bell peppers as the "cups", and we like to use either cod, salmon, or tilapia for the fish. Feel free to experiment with fish of your choice. Always steam hor mok, the stacked steamer works perfectly. In English you could call this "chicken in northern style chile paste". The Chiang Mai (northern Thai) chile paste has mild flavor (not spicy), made with turmeric, using local Thai chicken which are tasty and chewy. For best results, use the finest quality chicken you can find. We used organic free-range chicken breasts cut up into large chunks, with excellent results. 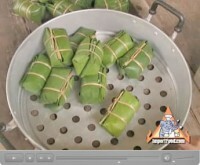 Traditionally, to prepare northern style steamed chicken, the chicken cavity would be stuffed with the chile paste. This recipe is prepared using the traditional turmeric chile paste but cooked a different way. Inspired by a chef focused on recipes of the old Chiang Mai culture.